Just in time for those hot summer months, a new ice cream shop and market is opening at The Orchard PHX. Splurge and Luci’s at The Orchard opened to the public Monday, June 6. These locations will join the already open, Pomelo, a full-service restaurant located on site. Luci’s at The Orchard is the marketplace located on property at The Orchard PHX and will be open from 6 a.m. to 10 p.m. daily. The building dates back to 1949 and is the old ranch home of Ralph Castro. Castro purchased the land from the Wasser family and transformed it into a citrus nursery. Many items sold inside Luci’s are sourced from local vendors. Unique gifts and specialty food items, hand-picked by the owners, will be available for purchase. The décor has an urban-European feel that is very simple and clean. A juice bar, sandwiches, coffee and baked bread will also be available. Call-in orders for food can be picked up at the pick-up window. Drinks and ready to go items can be ordered as you come up to the window. A large lawn for picnics will offer a great low-key dining option during the cooler months. An additional dog-friendly patio, designated on the east side of the market only, will welcome four-legged friends who want a place to visit with their owners. A full bar will also be inside Luci’s at The Orchard with happy hour specials on drinks only. Splurge is an ice cream and candy shop featuring gelato that will be open 11 a.m. to 10 a.m. daily. Splurge’s menu will have 18 toppings and 12 different flavors to choose from, including: But first, Coffee (coffee), Killa Vanilla (vanilla bean), Feelin’ So Berry Good (strawberry) and Have Your Cake and Eat it Too (cake batter). There will also be gelato pops and gelato infused drinks such as Mojito and Raspberry Lime. There will be a sorbet option for those who are non-dairy and many different types of cones to choose from—including gluten free! Located adjacent to the market, kids and families can indulge in various sweet treats such as homemade cookies and other ice cream novelties. The décor includes striped walls with beautiful white tile throughout. There will be gifts and candies people can purchase inside. There will also be a splash pad nearby for the little ones to cool off during a hot summer day. 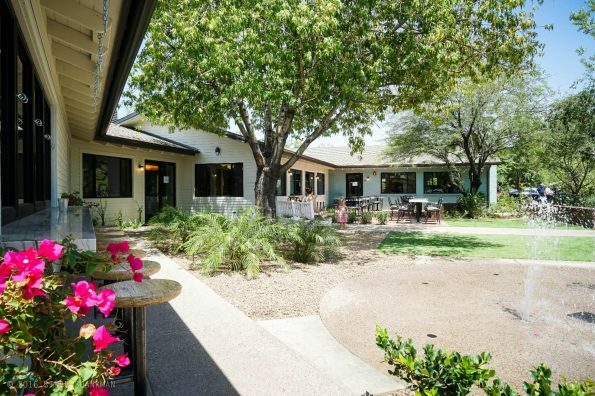 The Orchard PHX is a two acre venue located at 7100 N 12th St. in Phoenix between Northern and Glendale avenues. The property was an old citrus farm in the early 1900s that owners Ken and Lucia Schnitzer and partner, Jerry Mansoor converted into an adaptive reuse property. A 30-foot water tower sits in the center of the property, surrounded by more than 80 citrus trees. The Schnitzers, with Mansoor, were approached by Venue Projects to develop a space that would embody the essence and feel of the surrounding community. Thank you, your coverage is welcomed and appreciated.